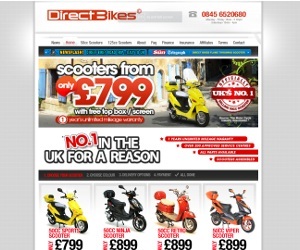 Direct Bikes is one a the leading UK scooter manufacturer and retailer. Their scooters range from the smaller 50cc right through to the bigger 125cc motors. Direct Bikes pride themselves on their not being a middle man, meaning they can keep costs down to a minimum and competitive for customers. They have in the past supplied popular celebrities as Katie Price, X Factor and Henry Holland. Direct Bikes has a huge catalogue to choose from, 1 year unlimited mileage warranty and the scooters are assembled for you.